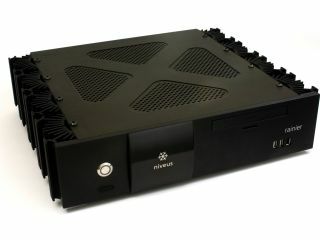 This Niveus Media Center PC is one of the first to feature HD DVD. Niveus Media has been showing off its refreshed range of Media Centers at CES that includes the new Summit Series: Rainier Edition and the hard-core Pro Series machines. Both of these lines are Viiv-certified and are amongst only a few MCE systems to feature HD DVD. While the Pro Series machines are built in a rack-mount form factor, the Rainier Edition machines are designed for the living room. With a heavily industrial design, the new Rainier Edition MCE PC runs Microsoft Windows XP Media Center and includes Niveus Glacier Passive Cooling via giant heat sinks to the left and right of the gothic aluminium chassis. "We see HD DVD as the natural successor to the DVD format," said Amir Majidimehr, corporate vice president of the Consumer Media Technology Group at Microsoft Corp.
"[It boasts] superb high-resolution video quality powered by the VC-1 video compression standard, great audio quality and innovative interactivity powered by HDi. We are very pleased to see Niveus bring together the power of HD DVD and Media Center together in such an attractive way." Niveus Media's Rainier Edition and Pro Series start at $3,499 and $6,999, respectively. Both products are available to buy today.